A few weeks ago I had the assignment to teach the Story of Noah and the Ark to my Young Single Adult ward. I had prepared carefully, I wanted to focus on the core elements of the story (there was a man called Noah, the Lord called him to preach repentance, he built an ark of considerable size, there was a flood of some kind, etc…) and in doing so introduce the idea that one does not have to take the story as literal to find value in it. I thought I had prepared well and presented the lesson in a way that was palpable to more critical eyes, or to those who may have been struggling with the logic of the story. After the lesson was over I was discussing the biblical narrative with some friends, and one of them mentioned something I hadn’t previously considered: sure we could deconstruct the science of the story all we want, but we are glossing over a much more troubling part of the narrative. God had instigated a mass genocide of the entire population of the earth (save for 8 people) because they were described as “wicked”. We know that God orchestrating death in scriptures is not uncommon. 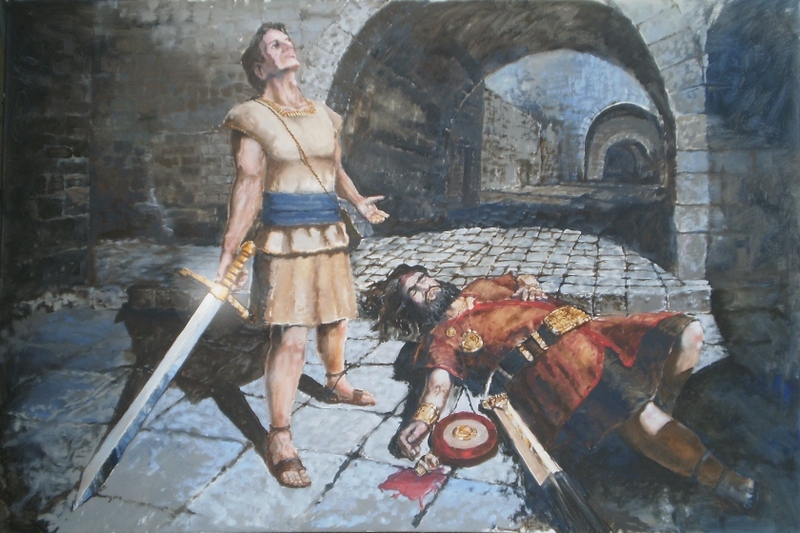 I remember many a seminary lesson focused in tackling the tough issue of Nephi being commanded to behead a drunken, defenseless man because it was the only way he could steal the brass plates and escape. Or Abraham being commanded to sacrifice his son Isaac only to be halted at the last moment. But I was drawing a blank remembering when I was ever questioning the morality of mass genocide instigated because the people were “wicked”. I’m not an expert on the scriptures by any means. But thinking through the story of the Old Testament I could think of plenty of cases where genocide occurred. There is the aforementioned story of Noah, the killing of the firstborn in Egypt, the destruction of Sodom and Gomorrah, the campaigns of Joshua against the Canaanites, Saul fighting the Amalekites and David fighting the Philistines. Granted some of these few examples were military campaigns, meaning both sides fought back, but were still targeted because of their religious or possible ethnic backgrounds. The book of Deuteronomy even goes as far as detailing what is to be done when people happen to be living in the cities that were given as an inheritance. Chapter 20 v. 16-17 “But of these cities of these people which the Lord thy God doth give thee for an inheritance, thou shalt save alive nothing that breatheth: But thou shalt utterly destroy them; namely, the Hittities, and the Amorites, the Canaanites, and the Peizzites, the Hivites, and the Jebusites; as the Lord thy God hath commanded thee.” Later verses even go on to specify that they are not to destroy fruit trees around these cities because they can be useful. To say this is disturbing is an understatement. It would be easy to square these instances away as the doings of that vengeful Old Testament God, but these things happen in the Book of Mormon also. The Nephites and Laminites frequently targeted each other for wars over religious and ethnic backgrounds. The Jaredite massacre. The destruction of all the “wicked” after the crucifixion of Christ, and examples of divine plagues and famines killing off large amounts of the population. The idea that any group can be killed at any moment based on your perceived worthiness is prevalent in our scriptures. This act of spiritual cleansing, or divine punishment is also known as genocide. To see this doctrine embraced and repeated across cannon is not only extremely disturbing and problematic, it also raises questions about how these scriptures influence the actions of modern peoples. The crusades and the massacre at Mountain Meadows come to mind. Furthering the already questionable morality of such actions is that God has shown himself capable of carrying out these genocides by Himself, as in the flood or the plagues in Egypt. But when God calls upon others to commit this genocide in His name a giant red flag shoots up in my mind. I am left to question if God behaves in such a violent way or if Nephi killed the drunken Laban in the heat of the moment and later used God to justify his actions, or if Old Testament military campaign was fueled by conquest and/or vengeance and God was used as a justification. When we question these instances the simple answer may be the most reasonable explanation. Is it possible that the people of the scriptures were just as fallible as people are today? And just because they said God justified their actions that doesn’t make it so. So instead of putting God into these situations to find some divine catharsis perhaps the solution is to take God out. Whenever we encounter divinely approved genocide and murder in the scriptures, we shouldn’t have to play mental gymnastics to explain away the death and loss, and why God seems so much meaner then than he does today. We don’t have to feel good about it, or be ok with it even. We all have to ask ourselves at some point if genocide really was the divine plan of our Heavenly Parents, or the justification of men. For me, love does not share a habitat with killing. Can I imagine a loving Heavenly Mother and Father orchestrating the most horrific images in our scriptures? I do not believe God orders genocide, and I believe that there are important lessons about man’s relationship with God to be learned from these stories. Maybe the two don’t really agree, but I cannot be at peace with believing in the vengeful, tribal god of the OT–he is completely contradictory to my personal understanding of my loving Heavenly Parents. Thanks for the post Justin! Your article addresses one of the issues that moved me to become an atheist/agnostic. To take your thoughts a little further: if we justify much of the genocide committed in the Bible by saying that maybe it was just man, not God, then we are undermining the truth of what the Bible or the B. O. M. tells us. And if we can question some parts, logically we have to be allowed to question every part. If we change the base message of some parts (that God ordered these atrocities) then we can change the base message of any of it. And justifiably so!!! I have a weird mixture of envy and pity for people who can still continue to believe in and love Christianity and Mormonism after serious consideration of these issues.